Governor Pat Quinn proclaimed June 14 as “Borinqueneers Day” in Illinois to honor the veterans of the legendary 65th Infantry Regiment, the all-Puerto Rican unit that distinguished itself in every United States war from 1898 to 2008. The United States Congress voted in May to issue the Congressional Gold Medal to the Borinqueneers. 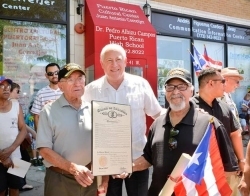 The Governor visited with three Borinqueneers on Saturday, June 14 to present them with a special proclamation at Dr. Pedro Albizu Campos Puerto Rican High School in Chicago’s Humboldt Park community. PHOTO 1: Governor Quinn is joined by Borinqueneers Juan Vázquez (left) and Santiago Perez-García (right), both of Chicago. Borinqueneer Raul Cardona (not pictured) was also honored. The Governor issued the Proclamation in front of the only school named for a Borinquneer, Dr. Pedro Albizu Campos Puerto Rican High School in Chicago’s Humboldt Park community.